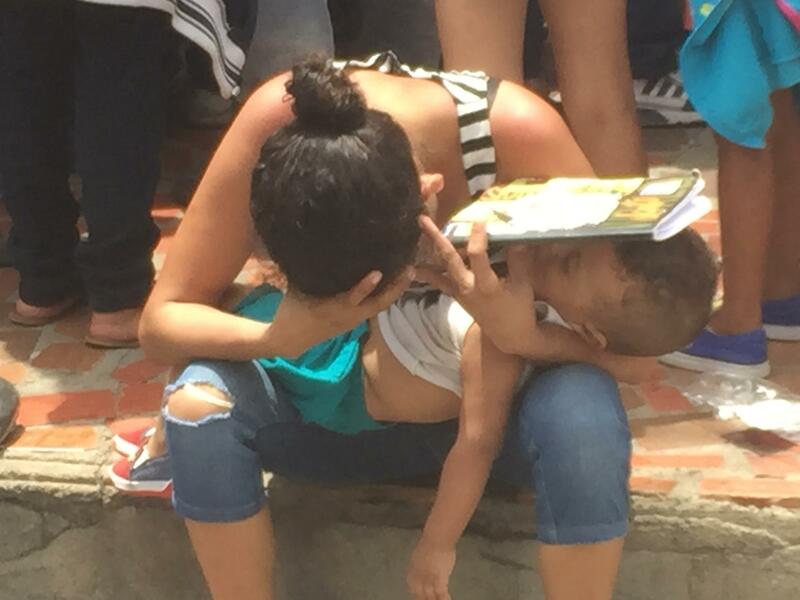 EXODUS OF THE DESPERATE A Venezuelan refugee mother and her infant son waiting for U.N. food stamp vouchers in Cucuta, Colombia, this month. Inside the Roman Catholic Scalabrini church mission, the U.N.’s World Food Program is signing up as many Venezuelans as it can for food stamp benefits, or bonos. But the waiting, clamoring crowd outside is simply too large and chaotic. An elderly woman faints in the mid-afternoon heat and, as mission workers press to keep the rest from entering, she’s brought inside to sit down and drink water. Outside, that’s exactly what’s worrying Zuleima Villalba. BANGING ON GATES Thousands of Venezuelan migrants crush forward for UN food stamp benefits at the Centro Cristiano in Cucuta, Colombia, this month. Villalba arrived in Cúcuta a month ago from Maracay, Venezuela – almost 500 miles away – with her husband and three young children. While holding one of them she manages to show me the cell-phone earbuds the family’s selling on Cúcuta’s streets in order to eat and pay daily rent for a small room near the airport. It isn’t enough. Wiping away tears, Villalba says she fears they’ll soon be sleeping on the street, as thousands of Venezuelans do in Cúcuta these days. Villalba and her mechanic husband, whose wages were decimated by hyperinflation, decided to leave Venezuela because their kids were seriously underweight. The average Venezuelan lost 24 pounds last year due to an economic catastrophe caused by collapsed oil prices and the mismanagement of a dictatorial socialist regime. That humanitarian crisis has launched an epic wave of migrants. By the end of this year an estimated three million people – a tenth of the population – will have left Venezuela since 2015. Most are pouring into neighboring countries like Brazil – and especially Colombia. Each day an endless stream of some 20,000 Venezuelans crosses the Simón Bolívar International Bridge into Cúcuta. Some come for food, then return. Some go on to countries like Ecuador. But about 5,000 of them stay in Cúcuta. Indigents like Elio Merciett, an appliances salesman from Barquisimeto, Venezuela. He arrived in Cúcuta three months ago but still sleeps on cardboard every night in a park near the border crossing. What little he earns at odd jobs often gets stolen. “The most recent people that are coming, they are in the worst situations,” says Ricardo Suppo, a World Food Program coordinator in Cúcuta who’s alarmed by the condition of the Venezuelans he’s seeing now. Even so, the U.N. is not formally declaring that desperate exodus from Venezuela a refugee crisis, which could raise the situation's global profile. This year it did urge countries receiving Venezuelans to grant them certain refugee safeguards such as healthcare, jobs and protection from deportation. 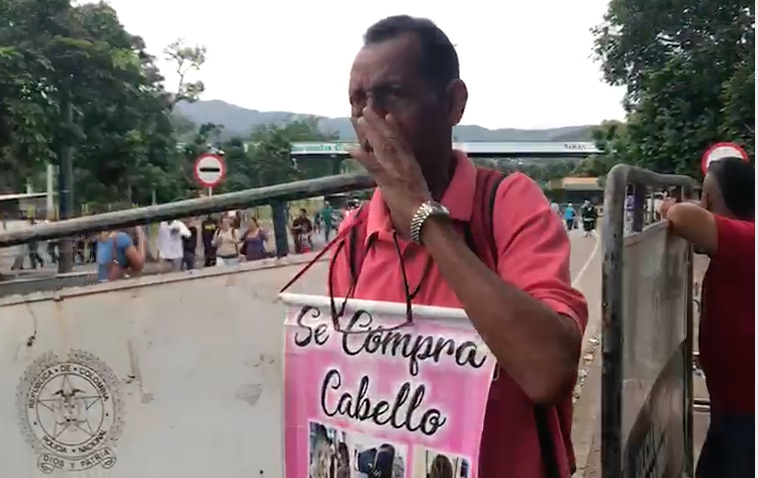 A Colombian man wearing a sign that reads "We Buy Hair" shouts for business from Venezuelan migrant and refugee women at the border crossing in Cucuta, Colombia. But U.N. officials concede they have few if any historical reference points for this calamity – and they’re at a loss to label it. It’s not a refugee emergency driven by natural disaster or war, like Syria’s. Yet it’s far worse than mere economic migration. “I prefer to call it a displacement crisis,” says Jozef Merkx, who heads Colombia operations for the U.N. Refugee Agency, or UNHCR. The UNHCR has called on the international community to give almost $50 million to aid Venezuelan refugees. The U.S. has pitched in $2.5 million and may give up to $10 million more. But Merkx told WLRN in Bogotá only about a third of the goal has been reached so far. “We need more resources, definitely,” he says – which is why his agency is widening its net and will soon launch an unusual online fundraising effort so private donors can help Venezuelans. But expats in South Florida – home to the U.S.’s largest Venezuelan community – argue the U.N. could better leverage those funds if it did declare this a refugee crisis. Groups like the International Coalition for Venezuela are lobbying hard for it, says expat and Miami paralegal Rafael Moros. Unfortunately, Moros is not exaggerating. One of the first things Venezuelan women hear when they cross into Cúcuta is men shouting, “Compramos cabello!” meaning, "We’ll buy your hair." HAIRCUTTING TO STREETWALKING Police in Cucuta, Colombia, take Venezuelan refugee women detained for prostitution back to the border for deportation to Venezuela this month. Here the wigmakers pay Venezuelan women a little more than $10 for their hair. That’s far less than the market rate in Colombia. But most women accept it because they need the cash. The wigmakers know their operation is less than ethical. When I tried to film one Colombian woman cutting Venezuelans’ hair in the open border plaza, she summoned a couple of thugs and ordered me to stop. She was holding scissors, so I complied. Still, Cúcuta is a small city whose own economy has been hurt by neighboring Venezuela’s collapse. 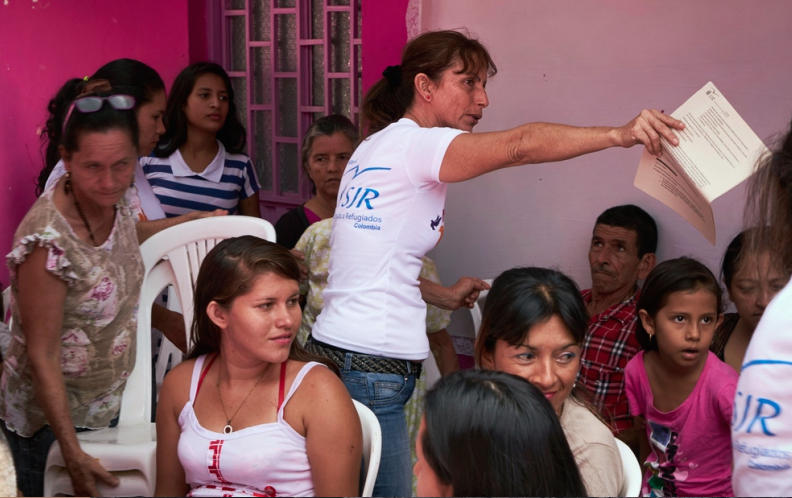 There are not enough jobs to absorb the refugees – so once the hair cash is spent, many Venezuelan women start walking the streets. WLRN's Tim Padgett onscene at the Cucuta border crossing. That includes 19-year-old single mother Yureli Suárez. When Colombian police hauled Suárez and several other Venezuelan prostitutes back to the border this month, Suárez pledged to be back in Cúcuta soon. But most Venezuelans in Cúcuta are on the pavement selling other things, from cigarettes to empanadas. That includes Junior Aranda and his family, despite their professional credentials. “I’m an oil engineer, used to work at the gas plants for Petróleos de Venezuela,” Aranda says, unfolding the employment documents he usually carries with him. Standing beside Aranda is his wife, Fátima, a veterinarian. Next to her is her mother, a computer engineer; her aunt, a child psychologist; and his sister, an architecture student. They decided to pool their inflation-ravaged savings and leave Venezuela this month after Aranda and Fátima’s twin babies caught German measles – because vaccines are virtually non-existent there today. Later on they show me the small, dark, one-bedroom apartment in Cúcuta, furnished only with mattresses, where the entire family – 13 people in all – are living. "THIS IS NOT HOW WE USUALLY LIVE" Venezuelan oil engineer Junior Aranda (left) and seven of the other 12 family members who live in a small, 1-bedroom home in Cucuta, Colombia. "It hurts a lot to lose a good career and be reduced to this," says Aranda, adding that the family may try to employ their talents in Colombia or another country like Peru or the U.S. once they scrape together the money. "But I have faith in God and my wife that we'll bounce back." A little later his wife whispers to me imploringly, “Please believe this is not how we usually live." Not surprisingly, none of them plan to be in Venezuela to vote in this Sunday’s presidential election, which most of the international community has dismissed as a farce rigged to favor the ruling socialists – and their disastrous rule. And about the food stamps program families like even Aranda’s were counting on? The U.N. has had to suspend it. The crowds were simply too overwhelming. Next week, Part 2 of “Escape From Venezuela” will look at the growing and sometimes covert role the South Florida diaspora plays in getting aid to Venezuelans – especially medical refugees.